Get a job. Choose your career. Be prepared for the unexpected. Which courses should I take first? 538 is the nations most respected site for sports, politics, and economic statistical analysis. They took issue with presidential candidate’s Marco Rubio’s comment that “welders make more than philosophers, we need more welders and less philosophers.” So they analyzed the statistics. 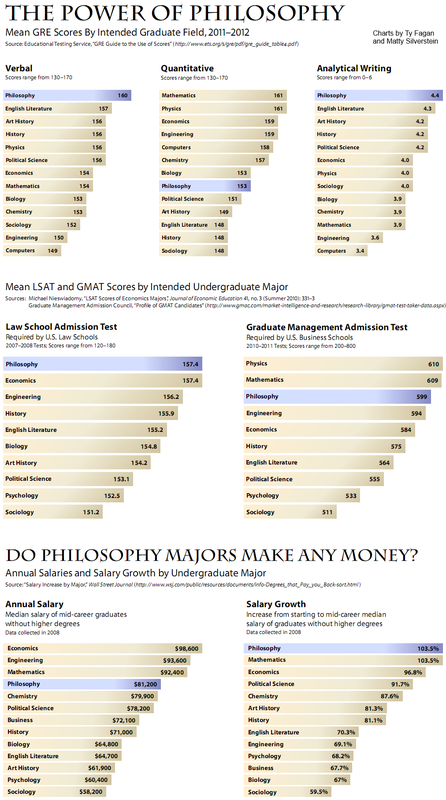 “But philosophy majors also have some of the highest scores in the LSAT and GMAT — the required tests for entry to law and business school respectively, according to figures from the Educational Testing Service (ETS). And when it comes to earnings for people who only have undergraduate degrees, philosophy majors have the fourth-highest median earnings, $81,200 per year, out-ranking business and chemistry majors, according to the ETS. Bar none, philosophy majors have the highest salary growth trajectory from entry to mid-career. “People with liberal arts degrees in disciplines like philosophy go on to do all sorts of jobs; most don’t just sit around and philosophize in coffee shops or even in classrooms. According to PayScale.com, annual wages for people with B.A.s in philosophy range from $37,000 to $83,000. For welders, the site says the salary range is $23,000 to $63,000. The Institute for Philosophy in Public Life is dedicated to expanding philosophy beyond the college campus. It was founded on the premise that anyone can do philosophy regardless of credentials..
For more information, visit our webpage at: www.philosophyinpubliclife.org. IPPL is part of the College of Arts & Sciences at The University of North Dakota. For more information about the University of North Dakota's Department of Philosophy and Religion visit our website: For more information, visit our webpage at: http://arts-sciences.und.edu/philosophy-religion/. This page and its contents © Copyright 2017 by Jack Russell Weinstein. Join Why? Radio each month as we engage in philosophical discussions about the most common-place topics. From explorations of hunting to discussions about domestic violence, from classic works of art to the most cutting edge digital media, from the American prairie to the heart of post-communist Romania, Listen for free at www.whyradioshow.org.